Sunday was the first of October, and yesterday was the second. Innocuous dates to everyone, and the words “Time passes so fast!” and “It’s October already? !” keep being repeated by almost everyone I’ve met. Time has no meaning for me. Day by day, I awake, and wonder why. The news of the shooting in Las Vegas has shocked me. Totally senseless. Yet I can’t do more than just be shocked and be sad. Donald Marlarkey has passed away. I actually feel more sadness over that. I don’t know why. Tom Petty has had his life support taken off, and no one knows if he’s dying or dead. We’re all dying. Indeed, every breath we take brings us closer to death. These morbid thoughts keep swirling in my head. I keep having to remind myself to focus only on today, not even tomorrow. To think of what I need to do today. To give over things that are out of my control, to God. To pray. To hope and trust. To drag myself out of bed to do what I need to do, like clean the cage of the guinea pigs. Yes, Project Guinea has been revived, and is now in full swing. Please welcome Heart – she’s the white one in the back – and Soul. Heart is the one who stole my heart away. Project Guinea started because I happened to be walking through Anchorpoint one day during one of my sojourns, and my aimless direction somehow took me to that particular shopping mall. When walking through the only pet shop there, the guinea pig now known as Heart literally took my breath away. I remember smiling happily watching her chew on a hay stalk. Back then, I didn’t even think much of it. But whenever I was petting the cats downstairs, or thinking of animals, Heart’s face came back to my mind. I told the wife about it, and a few days later, posted on Facebook to ask if I should get the pig. To my dismay, when I went back, while Heart was still on sale, the pet shop staff told me that Heart and her friend were best of pals, and it would break their hearts (excuse the pun) to be separated. I felt that I couldn’t do that to them, so I talked to my wife about the two of them, and we prayed. My wife decided that we couldn’t afford the time and finances to take care of two more babies in the house. I asked her to at least take a look at the guinea pigs first, before making a decision, and she agreed. So we went on Sunday, after church, and I had no expectations. I told my wife that if she was undecided, it was better to leave them to another owner who would be committed to loving them and taking care of them. In the end, because she loves me, and because she loves our boys, and because she fell in love with Heart and Soul, they became a part of our lives. A church friend was very kind to help us foot the bill for the initial outlay, which came up to more than $600 including Heart and Soul. I am well aware that adopting is a better choice, and giving abandoned or neglected animals a second chance is not done often enough. A few notes on this. We did not set out to have a pet or pets. We already wonder whether we can afford to get by without my salary when I end up on no pay leave or if I quit my job. 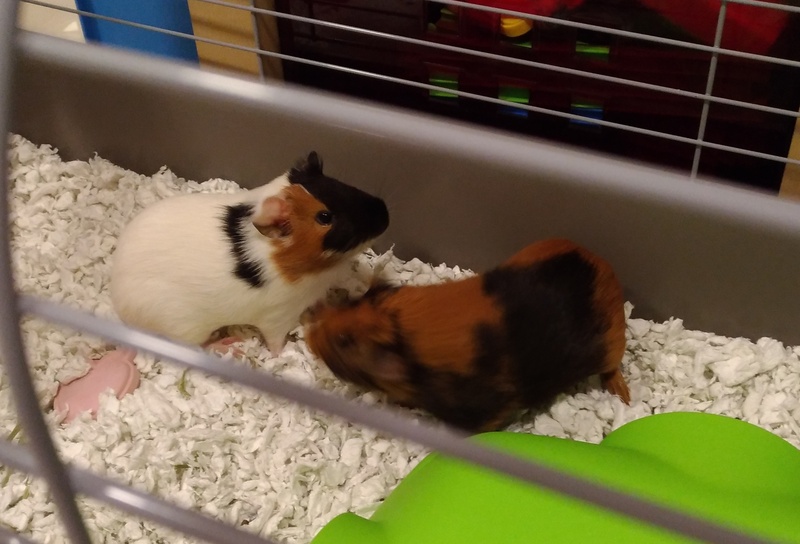 So we weren’t in the market for a pet at all – which means I won’t be going around pet shops just to look for guinea pigs. Heart caught my attention in passing, and something called out to me. That was the only reason I went back – and on second look, Soul is a pretty special guinea pig too. It’s hard for a depressive to be concerned with social causes. I’m not saying we shouldn’t be, or shouldn’t ask a depressive to be. For example, what I already do is to reuse plastic bags, and turn off the tap when I soap myself. But to add on a new social cause while I’m trying to sort through my own emotions is as much a lost cause as asking me to take up a new hobby. Nothing new is welcome. This morning, I forgot to order vegetables with my noodles at a stall I frequent, simply because the curry vegetables had run out, and I did not realise it. Something was off, and my mind couldn’t process what it was – so I simply ignored the outlier data, and forgot to order a vegetable dish. So please understand that it’s not that I don’t care. It’s that I can’t. Why do I bother even explaining myself? For the two reasons that this blog was established – to help in the understanding of depression as a mental illness, and to help fellow Christians who suffer. I cannot be a good witness if I don’t explain my rationale for certain decisions, and at the same time, I need to explain what goes on in my mind so that you, the reader, can get a better understanding whether you suffer from this, or you need to know how to help someone with depression. It’s been surreal. From wanting to cry at work, to walking through the Botanic Gardens in pain, to wanting to kill myself, being warded, and then coming home, and the various lows that I’ve been through… Now there’s a huge cage at home, with two new additions to our family. Last night, I sat next to the cage for half an hour before bed. The guinea pigs are still skittish, so they hid in their house the whole time. But I felt content and rested. I don’t know why. I can only be thankful. To God, and to my wife. I’ll leave this post dedicated to Heart and Soul. Thank you, for all of you who have offered to help with the funds for paying for the two of them.